Grocery shopping is a pain. I love a good bargain and the competition with myself on how much I can save that week in groceries, but the hours spent at the grocery store you can never get back. In this day in age we now can take advantage of grocery delivery services that do the shopping for us. With a couple clicks and a delivery fee, our hours wasted are now available for more fun things like going to the movies or getting manis and pedis. The downfall to this service is that they pick our items. Sometimes the bananas are not ripe enough or the avocados are too ripe. Or maybe the bread is too firm or soft. So we start from square one again. Big grocery chains offer all the brand names and the in house brand. There is something to be said about having too many options. Aldi Food Stores is a discounted food store that offers all the essentials in a small 4 /5 isle store. Their produce is the absolute freshest and they offer many organic options. They have off brands that look eerily familiar to our brand name favorites (secret: they are!!) They do sell some brand name items at a discounted rate. 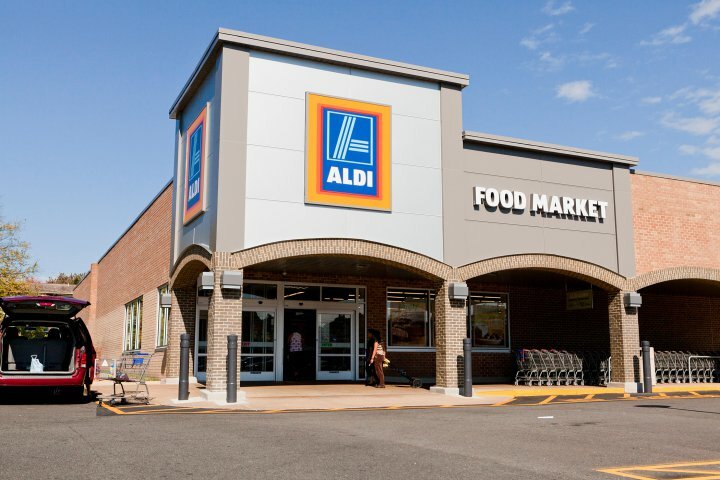 Aldi is a German company started in 1961. The founder is brothers with non other than Trader Joe’s (recognize the name??) founder and they share many similarities. Aldi is a great alternative in grocery shopping. It is a quick grocery run, grab the essentials, don’t spend your whole paycheck kinda place. Recently a store opened up in my area and I couldn’t wait to walk through those doors. I was singing Aldi’s praises to my boys before my grocery run today. Attempting to make grocery shopping an “exciting” excursion rather than a necessary one. The boys were a bit excited to see what this store was all about. The quarter to get a shopping cart was a hit. The boys loved the idea that the shopping carts were attached to each other and would only detach once the quarter was in place. They liked the look of the store, it was smaller than a regular grocery store, the shelves are not high and immediately the snacks were on display. They loved that they could grab left over boxes to hold the groceries that would later serve as “garage bays” for their cars at home. Most importantly they loved that a usual grocery store trip would last an hour, took less than half the time. I cooked an amazing dinner from our shopping trip to Aldi’s tonight. The grass fed beef got rave reviews from my otherwise non beef eating children. I highly recommend this grocery store. Your wallet and watch with thank you! !